The technical design and institutional set-up of the Caribbean Centre for Renewable Energy and Energy Efficiency (CCREEE) was successfully validated by energy experts and specialists of CARICOM Member States in a regional workshop, held from 21 to 22 July 2014 in Roseau, Dominica. The event was co-organized by theSmall Island Developing States (SIDS) Sustainable Energy Initiative – SIDS DOCK, the United Nations Industrial Development Organization (UNIDO) and the Government of Dominica, with financial support of the Austrian Development Cooperation (ADC). The workshop follows-up on the official request of SIDS DOCK to UNIDO in August 2013, to assist the small island developing states in the Caribbean, Pacific, Indian Ocean and Africa, in the creation of a SIDS network of regional sustainable energy centres. With technical assistance from UNIDO, a consultative preparatory process for the Caribbean centre was launched in close coordination with the Energy Unit of the CARICOM Secretariat. The process included the development of a needs assessment and project document on the technical and institutional design of the centre. With the inputs received at the regional workshop, the needs assessment and the project document on the technical and institutional design of the centre will be finalized. It was recommended to create CCREEE under the umbrella of the existing institutional framework of CARICOM. It was agreed to submit the final CCREEE project document for consideration by the next Ministerial Council for Trade and Economic Development (COTED) of CARICOM. It was suggested to launch a competitive selection process for the host country of the Secretariat of CCREEE. Prime Minister of Dominica, Hon. Roosevelt Skerrit, endorsed the establishment of the CCREEE, and announced Dominica’s interest in hosting the centre. “Dominica has the highest percentage of renewable energy (RE) in its energy mix among the Caribbean countries, therefore, Dominica would be the ideal location,” he said. By 2017, Dominica will become the only Small Island Developing State to export electricity. A partnership between the Government of Dominica and a French Consortium will develop a geothermal power plant for export and subsea transmission lines to French neighbours – Guadeloupe to the north, and Martinique to the south. Ambassador Vince Henderson, Permanent Representative of the Commonwealth of Dominica to the United Nations, and Chair of the SIDS DOCK Steering Committee, who spearheaded the initiative for the establishment of regional RE and EE centres, expressed gratitude on behalf of the small island developing states to the government of Austria for providing the funding for the establishment of the regional centres in the Pacific and the Caribbean and the support to African SIDS through the ECREEE. “The establishment of regional centres for RE and EE is one of the most progressive steps that UNIDO, SIDS DOCK and our governments can take towards the transitioning from fossil fuels to RE, and CCREEE will work with regional institutions, like the OECS, CARICOM, CREDP and CDB, to pool human and financial resources to transform the regional energy sector,” he noted. Dr. Pradeep Monga, Director of the Energy and Climate Change Branch of UNIDO, said the importance of the regional energy centre is to boost inclusive and sustainable industrial development in Caribbean islands. “The centre will play an important role in empowering the local private sector and industry to take advantage of growing job and business opportunities in the sustainable energy sector,” Mr. Monga stressed. The over 60 Caribbean experts and specialists, development and private sector partners in attendance recommended that the centre focuses particularly on policy implementation, capacity development, knowledge management, awareness raising and the creation of business opportunities for the local sustainable energy industry. The centre will act as a think-tank and hub for sustainable energy and will play a key role in creating economies of scale and a competitive sustainable energy market and business sector. It will address existing barriers and strengthen drivers through regional methodologies and tools. It will act as central service provider for the development and implementation of SIDS DOCK and Sustainable Energy For All (SE4ALL) activities. The centre will become part of UNIDO´s Global Network of Regional Sustainable Energy Centres. The SIDS centres will be announced as an innovative south-south partnership at the Third International Conference on Small Island Developing States, scheduled to take place from 1 to 4 September 2014 in Apia, Samoa. The event is the preeminent meeting place for international leaders and energy experts at the forefront of the clean energy movement. Securing energy independence and developing a clean energy industry that promotes the vitality of our planet are two reasons why it is critical to reaffirm already established partnerships and build new ones throughout the Asia-Pacific region and the world. The summit will provide a forum for the high-level global networking necessary to advance this emerging clean energy culture. Join a broad international community of over 1500 attendees from over 25 countries! The world’s largest wind and solar hybrid renewable energy project was recently put into operation in Kingston, Jamaica. The WindStream Technologies array was commissioned for the rooftop of the prominent local law firm, Myers, Fletcher, & Gordon. Expected to generate approximately 106,000kWh annually with a return on investment in less than four years, the plant should save the firm approximately $2 million in energy costs over the course of its 25-year lifetime. Consisting of 50 SolarMills delivering 25 kW of wind power and 55kW of solar, the installation is the largest hybrid solar and wind installation in the world. Positioned less than a quarter mile from the Kingston coastline, the rooftop frequently experiences wind gusts as high as 60 miles per hour (96.5 kilometers per hour). Fortunately, the grid-tied SolarMills not only safely generate energy, they also protect against surges under extreme conditions. The Peak Oil Crisis: Better Than Fire. Al Gore has something of a reputation as the Cassandra of climate change. But amid the doom and gloom—melting glaciers, ever-rising carbon levels, accelerating species extinction—the former vice president has been positively sunny of late. Now a new report substantiates Gore’s optimism. Research firm Bloomberg New Energy Finance predicts renewable energy will account for 49 percent of the world’s power by 2030, with another 6 percent coming from carbon-free nuclear power plants. Solar, wind, and other emissions-free sources will account for 60 percent of the 5,579 gigawatts of new energy capacity expected to be installed between now and 2030, representing 65 percent of the $7.7 trillion that will be invested. Gore is right that solar is driving the shift away from fossil fuels, thanks to plummeting prices for photovoltaic panels and the fact that solar fuel—sunshine—is free. “A small-scale solar revolution will take place over the next 16 years thanks to increasingly attractive economics in both developed and developing countries, attracting the largest single share of cumulative investment over 2013–26,” the report states. Solar will outpace wind as an energy source, with photovoltaic power accounting for an estimated 18 percent of worldwide energy capacity, compared to 12 percent for wind. That’s not surprising given that a solar panel can be put on just about any home or building where the sun shines. Erecting a 100-foot-tall wind turbine in your backyard usually isn’t an option. In the United States, solar is projected to supply 10 percent of energy capacity, up from 1 percent today. In Germany, though, solar and wind will account for a whopping 52 percent of all power generated by 2030, according to the BNEF estimate. These are all projections, of course, based on the existing pipeline of projects and national policies and involving a certain amount of guesswork. Whether the world kicks its reliance on coal-fired electricity will depend in large part on what kind of energy choices China and India make. China installed a record amount of solar capacity last year and has set ambitious goals for ramping up renewable energy production. But old ways die hard. While the Obama administration has proposed regulations to slash carbon emissions from coal-fired power plants, the U.S. Export-Import Bank, on the other hand, is considering financing a 4,000-megawatt coal-fired power station in India. So…Water issues. Quite a big deal. I’m writing my master’s degree thesis and it regards water issues and the Israeli-Arab conflict. My argument is that when together with other factors, water issues, although not directly, lead to conflict. I’m using the Theory of Relative Deprivation as a theoretical base, by Homer Dixon. Anyway, water issues. According to the Millennium Development Goals report 2012, 11% of the world’s population remains without access to a reliable water source. Imagine being yourself incapable of drinking a glass of water when thirsty or don’t having water for a bath. Well, these 11% go through that everyday. 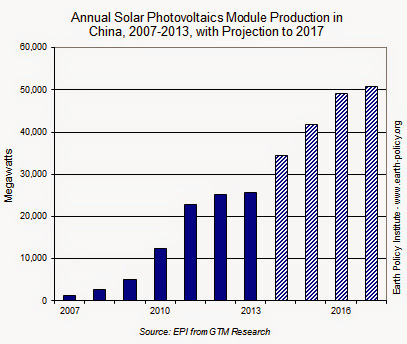 China installed a world record amount of solar photovoltaics (PV) capacity in 2013. While this was the first time the country was the number one installer, China has led all countries in making PV for the better part of a decade. 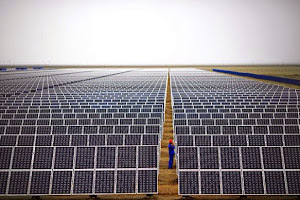 China now accounts for 64 percent of global solar panel production—churning out 25,600 megawatts of the nearly 40,000 megawatts of PV made worldwide in 2013—according to data from GTM Research. As demand for increasingly affordable solar power continues to climb around the world, GTM Research projects that China’s annual solar panel output will double to 51,000 megawatts by 2017, representing close to 70 percent of global production at that time. 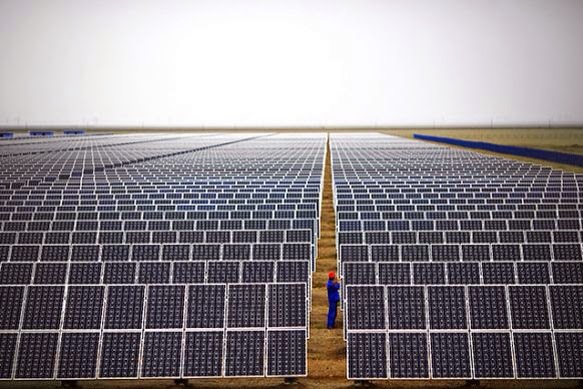 Beijing no doubt had such a quick industry ramp-up in mind when in May 2014 it announced a new national PV capacity goal: 70,000 megawatts of installed PV by 2017, up from 18,300 megawatts at the end of 2013. To put that in perspective, if it meets that goal China will add more solar electricity-generating capacity in four years than the entire world had in place in early 2011. For more information, see the latest Solar Indicator from Earth Policy Institute, at www.earth-policy.org.